An unique eye catcher with a pink wow-factor – the Customized Calendar A5 for 2019! The golden foil stamping on the robust, structured hardcover with your personal golden imprint, the lovely designs, motivating quotes and individual planning pages make the customized daily calendar shine inside out. 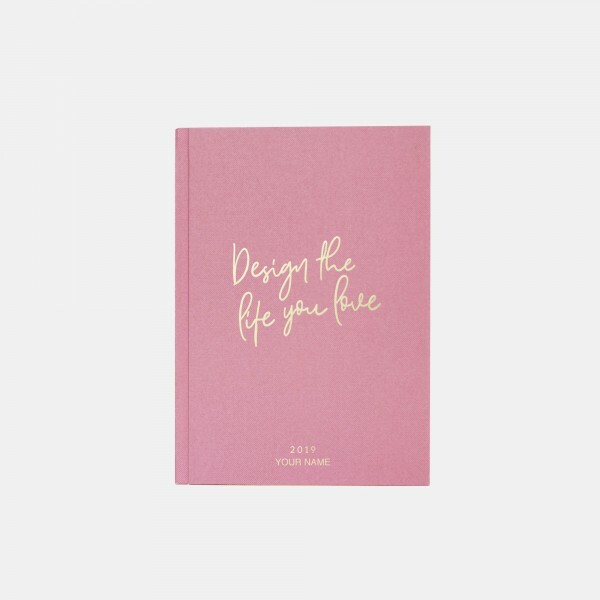 You can find a weekly overview, note section and to-do list on a double page in the feminine planner and can note all deadlines, birthdays and anniversaries in the monthly and yearly overview. Two ribbons make sure you never lose track of your plans – perfect for uni, the office or for working from home! You can choose up to 10 characters from the following list: A B C D E F G H I J K L M N O P Q R S T U V W X Y Z - . " ' & 0 1 2 3 4 5 6 7 8 9. Please note that blanks also count as characters. Ready for shipping within 15-17 working days. This customized product is excluded from return or refund of the order. For further information, please have a look at the Terms and Conditions.